Looking more like lizards but displaying certain characteristics very different from them, smooth newts are common in UK. Highly prevalent in the lowland areas, this one among its other species is the most common. Appearance: Smooth newts display a light brown or olive green color on their bodies accompanied with dark spots on their throats. Females and males both have orange colored bellies covered with black spots. Females can be identified by their body color, which is paler than the males. Skin: They have a smooth skin texture which is noticeable when they are on land. Length: Length of the body and tail varies from 8 to 11 cm. Females are generally shorter than the males. 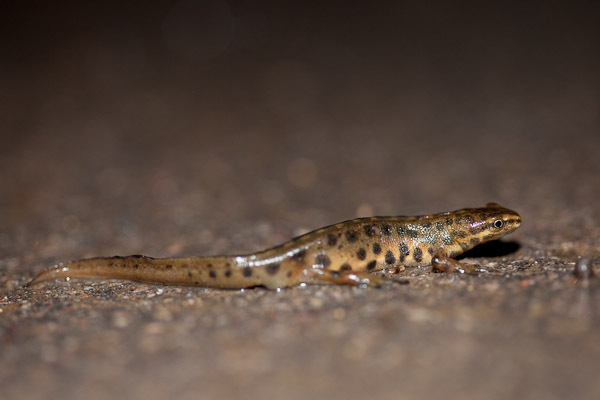 These Common Newts are scattered all over Europe including Ireland and Britain barring regions lying extreme north in addition to parts of Iberian Peninsula and Southern France. You may even find them in western Asia and Russia. Among all the species of Newt, only Smooth Newt can be found in Ireland. 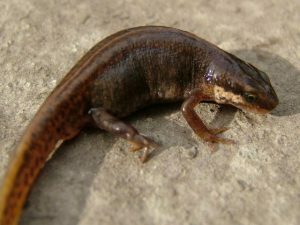 When they are not breeding, these newts can be spotted in swamps, deciduous woodlands, parks, gardens, wet moorland, marshy areas and farmlands. Garden ponds have emerged as one of the primary habitats due to pollution in other water bodies. While breeding, they generally prefer stagnant water for which they inhabit areas like ponds and lake margins having loads of weeds. Different behavioral patterns can be observed in these creatures. On land, they catch their prey by sticking their tongue out but in water they simply hunt them by using their teeth. You cannot find them during the day as they are nocturnal, coming out only after dar. All day they spend time hiding themselves under huge rocks or piles of manure. They shed off their skin frequently, almost once in a week. They feed on different types of worms, insects and slugs when they are on land. In water, they would rather eat water snails, shrimps, tadpoles, water lice etc by directly grabbing by their teeth. They do not have to toil much as their food is available at the surface of water. Newt larvae eat crustaceans and invertebrates living in water. Starting by March, reproductive season ends in May. Moist weather conditions are preferred by these newts for reproducing. 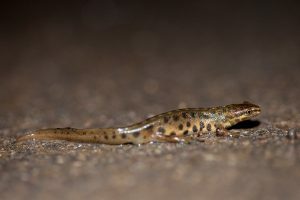 Smooth newts attain sexual maturity at the age of three and as reproducing season approaches, males develop a jagged top from the head covering the tail. Their spots become prominent body color also darkens. Another feature by which males can be identified during mating season is the flaps that develop on their toes. They mate on land and before mating the males signal the females through various gestures and movements, like slapping their tails and vibrating them. After the initial courtship, males deliver sperm that is absorbed by the female into her reproductive opening. After fertilization, the females are capable of laying around 300 eggs in the entire breeding season. The females can lay up to 12 cream colored eggs in a day on the leaves of water plants and then hide them by folding them up. These eggs are almost 1.5 mm in size and they hatch after 15 to 20 days giving birth to larvae that develop feathery grills and forelimbs before the hind limbs. Stagnant water body with high pH content and loads of vegetation is ideal for the breeding newts. On an average, they live for 5 to 6 years but they might as well live for 20 years. They hibernate from November only to rise by March when the temperature is suitable for them to breed. They avoid vegetation while they are hibernating, preferring to stay beneath the surface of the soil. Infant newts breathe through gills that they eventually get rid of during the end of summer when they move out of water. They are well adapted to swimming with a tail that functions like a paddle, helping them swim faster. They are being preyed upon by birds, grass snakes, other aquatic creatures and amphibians. Fishes present in garden ponds prey upon their tadpoles. 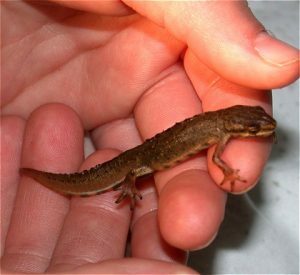 As per UK’s Wildlife and Countryside Act of 1981, trading of these newts is prohibited. Ireland has laws against the killing or capturing of these newts as they are the sole species of newts there. They are not a threatened species according to IUCN. Housing: Provide them a semiaquatic setting as they are adapted to live in water and land. A large tank made of glass or plastic should be furnished with moss, logs and soil substrate for them to hibernate. When breeding season approaches, make sure they are moved to a moist place. Feeding: Feed them with insects, snails and other aquatic creatures that they feed on in the wild. Care: Ensure correct temperature and environment for the newts to live in. Know about some of their most interesting facts. They make a ‘popping’ sound whenever they rise for air above the water surface. They get agitated when they find other newts eating. Of all the newts, these mostly prefer to stay on land. Quite frequently, at least once every seven days they shed their skin. Males whip their tails and wave their arms for signaling the females for mating. They are often mistaken as lizards due to their habitats though they are inactive and smooth-textured unlike lizards. Smooth newts known for their smooth body and distinct features which segregates them from other newts. They are prevalent in UK though they are declining gradually for which steps are being taken to protect them. 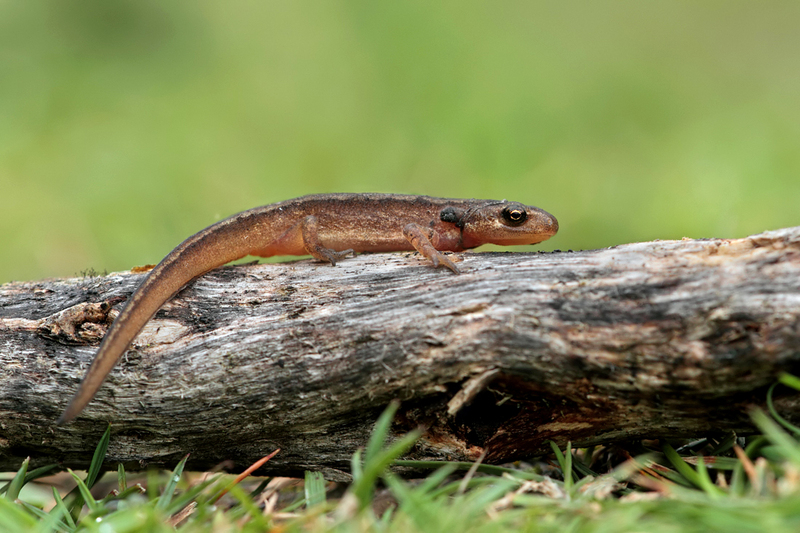 These pictures may help you know the Smooth Newts better.